A powerful No 8, grandson of former Springbok Piet Malan, Joubert proved to be one of Brendan Venter's best signings for Saracens from South Africa. A relatively unknown player he ended up captain in the absence of the injured of England lock Steve Borthwick. His powerful ball-carrying skills and nimble work at the line-out made him one of the Premiership's best performers and he was named in the shortlist for player-of-the-season. Joubert guided Saracens into the final of the Premiership before being defeated by Leicester. A natural leader, the back row made the move to Saracens from the Lions, the Super 14 outfit, in the summer of 2009. His last appearance (he made 28 in all) for the South African province came as a replacement against the British and Irish Lions on the 2009 tour. 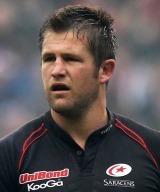 Joubert took over the captaincy of Saracens for the final two months when Borthwick was hit by a knee injury.